The emergence of geo-synthetic fabric industry has resulted in the ability of engineers and contractors to design and construct mechanically stabilized earth structures using fabrics. 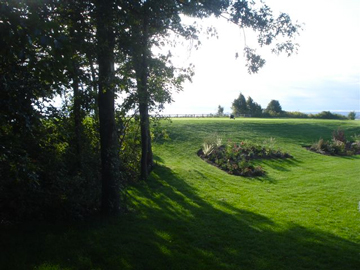 MSE structures have a long history of use for new construction as well as the repair of failed earthen embankments. NETCO specializes in the construction of such mechanically stabilized earth structures in coastal bank environments. 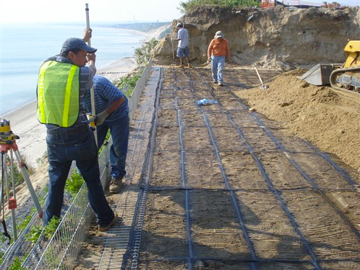 We work with the client, the geotechnical engineer or coastal geologist, and suppliers to design an MSE wall system that will restore and/or reinforce a coastal bank against further collapse or erosion. We also recommend various types of native coastal plant vegetation material including various types of “live stakes” that can be incorporated into the MSE system. 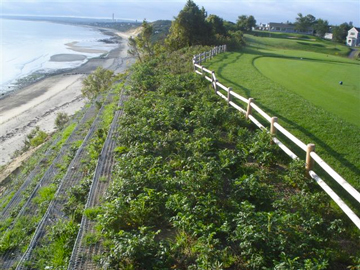 NETCO provides vegetation recommendations for restoring native bank habitats for birds and other wildlife as well as provides an aesthetically pleasing look to the completed MSE retaining wall installation.